The study provides a methodology to define fisheries in the context of MSP using Vessel Monitoring System (VMS) data from fishing vessels to determine fishing efforts and establish ‘Principal’ fishing areas. VMS data were collected from German and non-German vessels operating within the German EEZ, as well as data from German vessels operating in other defined parts of the North and Baltic Sea were also collected for the study. VMS data from 2005 and 2006 as well as other supplementary information from scientific sources (ICES) and local fishermen were collected, classified and analysed through various data modelling techniques to come up with charts and maps defining principal fishing areas.Principal areas of the fishing effort for the EEZ are defined as areas in which 75% of the effort of either year is carried out. How can one identify and define areas with high fishing interest using VMS data? Knowing where fishery occurs can be very useful in identifying potential conflicts and properly plan maritime activities, thus including measures that can preserve principal areas for fisheries. The use of VMS data to define principal areas (by tracking vessel movements) therefore provides some balance and can inform policy makers about areas that are highly valuable for fisheries to enhance decision making that also considers the sectors spatial requirements. To present a method for defining principal areas for fisheries on common fishing grounds, given the limited access to consistent data sources for internationally operating fleets. The study involved the collection of VMS data from vessels operating in specific areas to define principal areas for fisheries within and around the German EEZ at high spatial resolution. The study area was defined by specific latitudes and longitudes in the North Sea, the Baltic Sea and the German EEZ. VMS data from 2005 and 2006 were used for the study. While the 2005 VMS data only included vessels time and position - as prior to 2006 only that information was available for foreign vessels within EEZ boundaries - 2006 data included vessel code, position, time, speed and direction. VMS recordings followed different national protocols in relation to time intervals of recordings. Most recordings were made at hourly and 2-hour intervals (43.5% and 36% of all records respectively). However, shorter intervals of 6-15 min were applied for the Netherlands and UK. Other supplementary data on the type and size of fishing gears as well as catches were gathered from scientific sources, during an ICES workshop, as well as from local fishermen. Missing speed values as well as speed records considered inaccurate (e.g. Polish vessels) were replaced by an arbitrary speed of 2.0 knots, rather than conservative estimates (e.g. some Swedish vessels). It must be noted that, this procedure applied to less than 1.5% of all records. This was followed by classifying vessels based on nationality and available data. German vessels were classified according to their log-book information on a day-to-day basis from 2005 and 2006 while non-German vessels were classified only based on 2006 data and other supplementary data. Four VMS features were evaluated for each vessel: speed-frequency distribution, areal extent of operations, pattern of fishing operations and speed-time profile. The first group of vessels were characterized by high speed in typical trawling speed bands of either 3-5 or 5-7 knots. Peak trawling speeds were identified by speed-frequency distributions. Speed-time profile for trawlers were low-speed bands for several hours. German, Dutch and UK trawlers with speeds of 5-7 knots were classified as large beam trawlers (TBBL) (>300 Horse Power[HP]) as compared to others operating <300 Horse Power (HP) at 3-5 knots. The second group were vessels with small share of speed in the trawling speed bands and vessels with increasing speed shares towards zero. These were further grouped based on the latitude or longitude in which they operate. Fishing efforts were gathered from Gill netters, Demersal otter board trawlers, Pelagic trawlers, Large beam trawlers and Beam trawlers (TBB). The VMS data were then analysed as points and density estimates, calculated as fishing efforts by time, speed, area covered and fishing method and modelled to define principal areas. VMS data modelling comprised two main steps: first by defining an activity state (time, speed, area covered by a vessel) and then calculating its corresponding effort value. Activity states are primarily speed based. In calculating fishing efforts, average quantitative properties were assigned to each fishing position to account for uncertainties of activities between two subsequent VMS records. Each position was then substituted by four new dislocated positions representing statistically averaged behaviour of vessels. 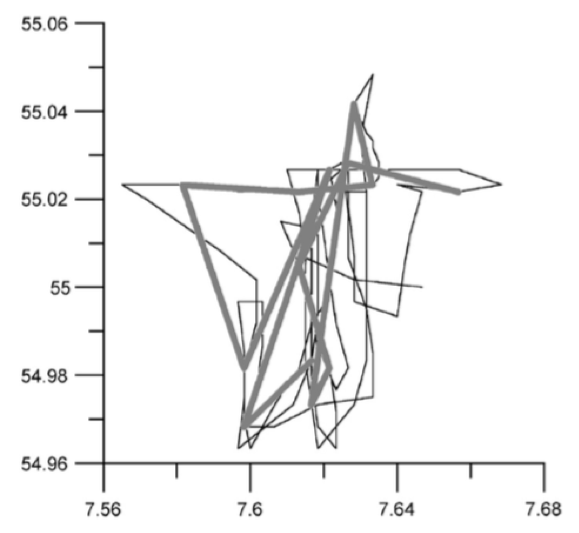 These positions were calculated from the mean fishing speed multiplied by the time interval and relative position in a respective direction, superimposed on the main direction between the current and next position. 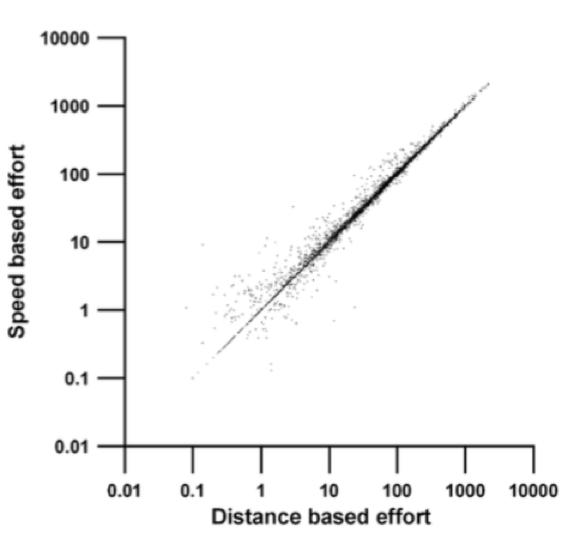 The distribution of interval distances shows that 46% of distance data were located within a range of 3nm, so that effort data were aggregated in areal parcels approximating 33 nm2. 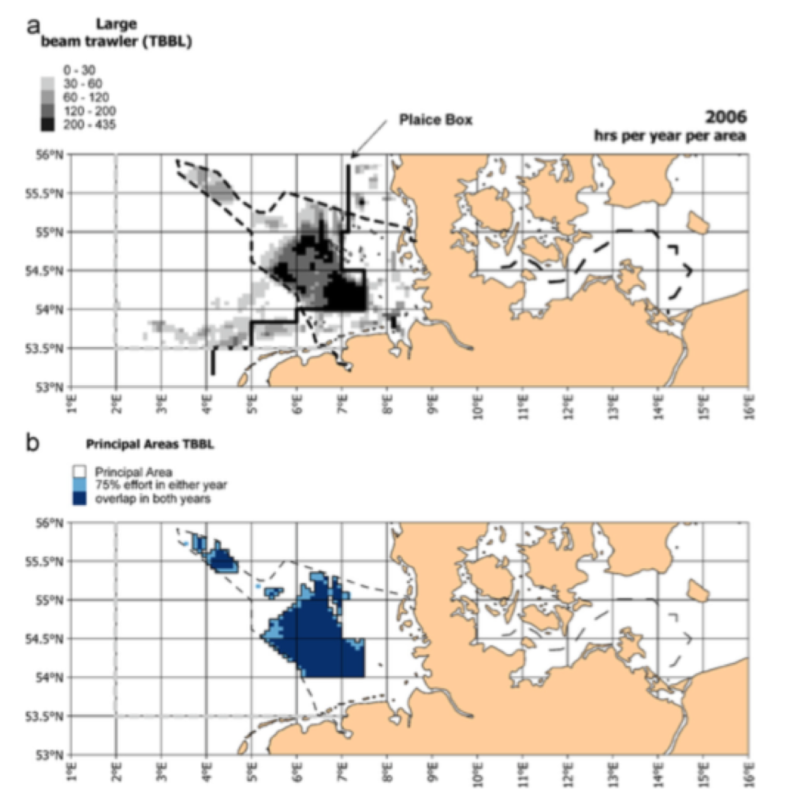 Principal areas were defined as the maximum extent of composite 2005 and 2006 spatial data within the German EEZ, with a minimum size of 3 adjacent areal parcels per spatial unit. Areas for each type of fishery and year had 75% of the total effort executed. Two new measures for fishing activity were introduced: 1) fishing efforts in terms of hours per area and 2) principal areas for fisheries. These two new measures are important for defining and identifying areas of high importance for fisheries in the absence of adequate data including catches. A procedure was adopted to incorporate information on multi-national fleets and to apply VMS data analysis to calculate and compensate for missing values. The method can be transferred and applied in other projects and practices, and can serve as a guide or method for defining principal fisheries areas across all seas to guide MSP processes and compensate for inability to define and zone fishery areas. The delineation of principal areas is an appropriate method to indicate key areas for fisheries which may be regarded as minimum areas required to maintain fisheries.